DreamGYM support door bar is great solution if you want to bring your outdoor swing accessories inside for cold months and rainy days. 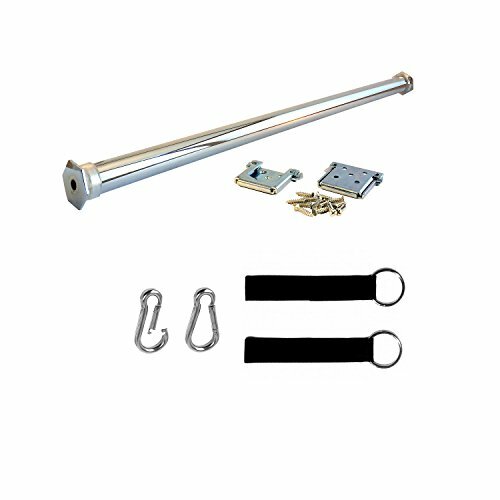 Chrome plated bar adjusts to fit most standard width door frames from 24″ to 36″ wide. The weight capacity for the bar alone is 200 lbs, so teenagers and adults can do chin-ups too! Safe. Easy to install. Fits door frames 24″-36″ wide. Weight capacity 300 lbs. Recommended age 3-99. Includes support bar, mounting hardware, a pair of straps with snap links. Your door will close with the bar in place. If you have any questions about this product by DreamGYM, contact us by completing and submitting the form below. If you are looking for a specif part number, please include it with your message.